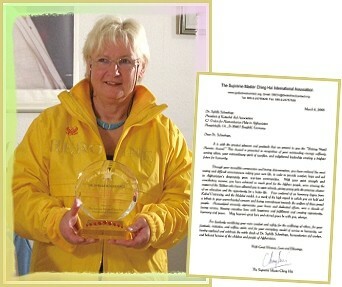 On April 26, Golden Year 5 (2008), on behalf of Supreme Master Ching Hai, members of Her International Association Berlin Center presented the Shining World Heroine Award to Dr. Sybille Schnehage for her long-time dedication, selflessness and humanitarian work in Afghanistan. Many years ago, her father repaired an old wheelchair and donated it to the needy in Afghanistan. After that, Dr. Schnehage found herself visiting a Pakistani refugee camp in Peshawar, located on the border of Afghanistan, to arrange medical help for many of the needy children there. Inspiration continued to move her in 1992 when she helped establish an aid organization called Katachel e. V, lovingly named after a local boy and his village. Today it remains a small association in her homeland of Germany, but has become one of the biggest in Kundus Areain, Afghanistan. One of Dr. Sybille’s philosophies is: “There is no better way of safeguarding yourself than through love.” She has done some extraordinary work and proudly told our Association members about one of the villages she has worked in, “Every house has its own well. Every house has a power supply. There is a girls' school and a boys' school in the village. We have a shoe factory, a wool blanket factory and a football field.” She has also used her diplomacy to cooperate with the government, “I am happy that we were able to build nine small bridges. Together with money from the Dutch Government we have built bridges in Aljabad, Omachel, Ibramchel, Schalamasar, Koscheraltan and here in Ludin. And I hope that over this bridge a lot of happiness will come into the village.” By creating new opportunities, Dr. Sybille’s loving heart has reached out to those vulnerable souls who have a chance now to live with happiness and fulfillment in their lives. By learning the local language of Dari, she has enabled herself to personally educate the people on how to make a better life in their community. Over the years, she has endured tremendous tests and difficult circumstances risking her own life in order to provide comfort, hope and aid to Afghanistan’s poor, war-torn communities. With her quiet strength and conciliatory manner, she has achieved so much good for the Afghan people, that even the Taliban have paid her respect and allowed her to open schools. She has courageously stated, “I personally have no fear at all.” She has earned the conferral of an honorary degree from Kabul University and the Malalai Medal, which is a mark of high regard and a tribute towards the welfare of the proud Afghan people. Thank you, Dr. Schnehage, for your good heart and your incredibly noble life of courage and generosity. May Heaven’s great love and eternal grace be with you always! 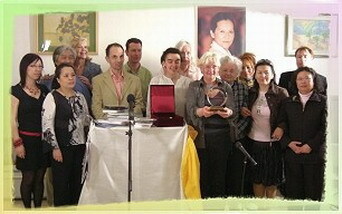 for the US$10,000 contribution by Master.